Informal land markets are essential for those who want to access land for housing, invest their savings, or make capital gains. It is also much simpler to participate in informal rather than formal land markets, and land prices are inversely correlated with the degree of tenure informality. The study also shows how a large share of the land plots ultimately traded on the formal market were initially offered for sale on the informal market. In order to study the different markets and the linkages between these markets, the authors propose a new method based on a systemic analysis. Interviews with a large number of land stakeholders about their practices, combined with a comparison between the rules issued by public authorities and the actual practices, made it possible to understand the numerous transformations incurred when land is offered for sale—including those related to land tenure. The authors describe these transformations along three “land delivery channels”: customary, formal public, and private. The linkages and the competition occurring between these channels are presented in the description of the land system. This systemic view can show, for instance, how the development of the formal market—though still limited—goes hand in hand with large purchases of agricultural land in the peri-urban area of ​​Bamako and its rural hinterland, and pushes up the price of land. A quantitative survey on a large sample of land plots transferred over the previous three years in the peri-urban areas and rural hinterland of Bamako also brings important insights into the role of the different stakeholders and makes it possible to quantify the spatial extension of markets. The advantage of the proposed method goes beyond the description of the land delivery system in Bamako and its large periphery. It poses an appropriate methodological framework for a detailed analysis of households’ strategies for gaining access to land and of the barriers that they face. It also helps identify the determinants of land prices, taking into account the diversity of land tenure forms that coexist. The proposed approach can thus be of great use for policy making, which requires a detailed understanding of land access mechanisms. 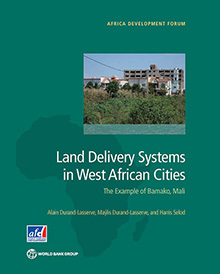 Beyond the specific case of Bamako, the analysis could be used in other West African cities where several sources of land rights legitimacy coexist and where a large number of stakeholders operate, irrespective of whether these stakeholders are recognized by land administrations that are often undermined by corruption and whose decisions may prove contradictory.